Ada pertanyaan untuk Thanh Son Noi Bai Airport Hotel? Ketika mengunjungi Hanoi, Anda akan merasa layaknya di rumah ketika berada di Thanh Son Noi Bai Airport Hotel yang menawarkan akomodasi berkualitas dengan layanan luar biasa. Dari sini, para tamu dapat menikmati akses mudah ke semua hal yang dimiliki oleh kota yang aktif ini. Dengan lokasi obyek wisata utama di kota ini yang sangat dekat seperti Bandara Internasional Noi Bai, Tram Y Te Xa Hien Ninh, Tram Y Te Xa Nam Hong, tamu akan sangat menyukai properti ini. Thanh Son Noi Bai Airport Hotel juga menawarkan berbagai fasilitas untuk memaksimalkan pengalaman menginap Anda di Hanoi. Para tamu dapat menikmati fasilitas di tempat seperti WiFi gratis di semua kamar, resepsionis 24 jam, penyimpanan barang, Wi-fi di tempat umum, tempat parkir mobil. Masukilah salah satu dari 20 kamar yang menggoda di sini dan lepaskan rasa penat Anda dengan sejumlah fasilitas yang tersedia seperti televisi layar datar, kamar mandi tambahan, lantai karpet, kamar pas, akses internet - WiFi. Properti memiliki berbagai pilihan fasilitas rekreasi yang memungkinkan Anda melakukan bermacam hal selama menginap. Nikmati lokasi dan pelayanan tidak terbandingkan di Thanh Son Noi Bai Airport Hotel. The photos are accurate. The room and bathroom were a bit old. The shower and toilet are combined in the bathroom, without a divider. The AC worked well. The staff did not speak good English, but were very proficient with Google voice translate. Good location if you need to sleep after a late/ early morning flight. Very close to the airport and easy transfer with taxi from the airport. Not in the nicest neighborhood since its far away from Hanoi but you go here to sleep nothing else. Very quick as I just needed to rest between flights. Hotel is a 20-minute walk from the airport but they offer a US$3 pickup service. The staff was friendly and polite, although most do not speak english. Interesting neighborhood too, with a market, some ricefields and the usual Viet food stalls and cafes. Would stay longer if I had the chance. I arrived there by 1am and the staff was still willing to assist me. The rooms are clean and the aircon is working perfectly. Theres heater as well. The location is very close to the airport so sometimes taxi drivers will refuse to accept you but the hotel has airport transfer for a fee. We arrived late at night and left early in the morning for a flight out of Hanoi. This was a nice little hotel to spend the night in and the friendly check-in clerk offered us a ride to the airport in the morning for only $4. 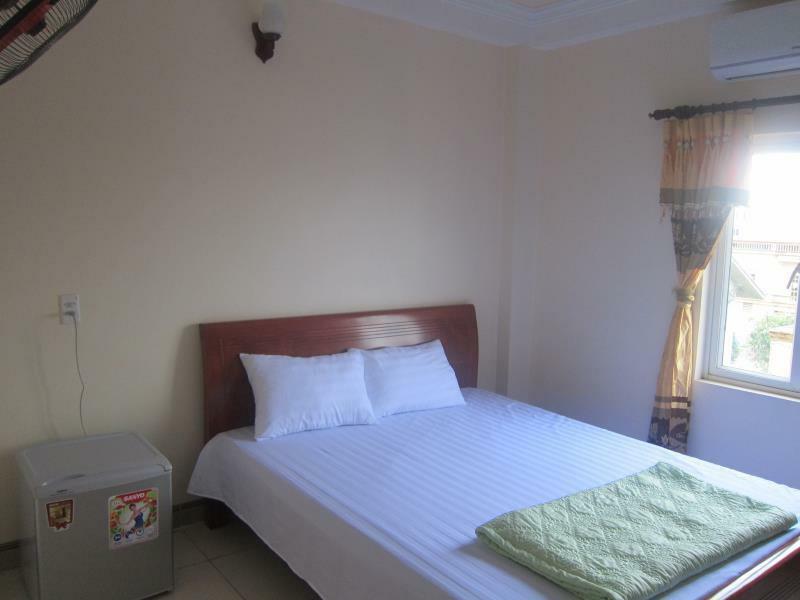 The beds are hard, but if you'll be traveling around budget hotels in Vietnam, you'll have to get used to it! We just stayed there one night to be near to the airport as from the centre it takes about 1,5h. Problem was to get there from the airport as no taxi wanted to take there as it was too near, but finaly we managed. Friendly receptionist took us to the airport very early for a few dollars. Would recommend to anyone who has an early flight to catch. The advantage of the horel is that it is very near to the airport. If you are having a early flight consider staying in the area. We arrived early and for early check-in the guy insisted that we pay 50%more. But we also checked out way too early, but of course there was no early check-out discount. Room was clean but very basic. No heater in freezing cold. Loud at night with people coming in and out in the corridor. They wanted to scam us at a reception. The whole building was big construction site. Sounds of heavy tools wakes us up at 5 o'clock every morning and they continued up to 11pm. It was our last hotel in Vietnam after 1 month of travelling, but it was really the worst. Never again! The hotel is nice and close to the airport, and friendly staff received us. 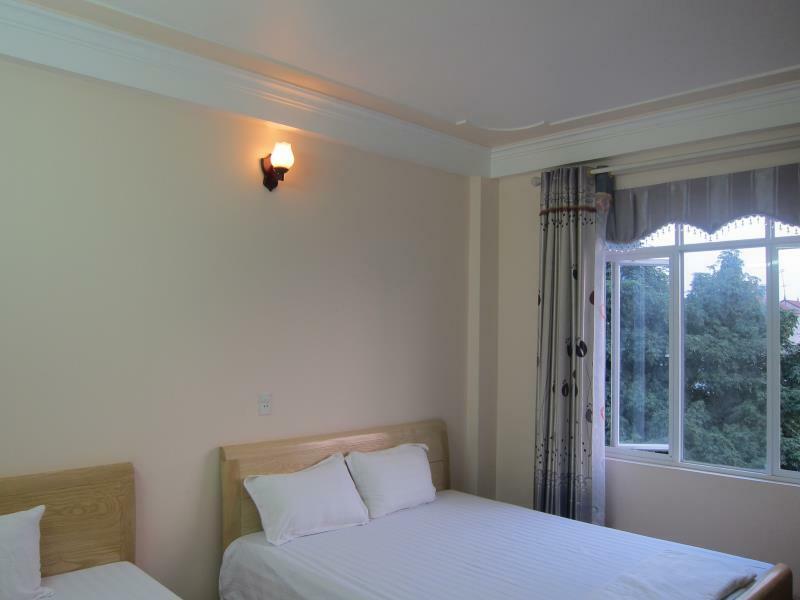 The hotel itself is basic, with slightly tired facilities in the room and rather laboured air conditioning. Breakfast isn't included but snacks and drinks are available to buy. We had a problem at the airport with taxi drivers seemingly unwilling to take us the short distance to the hotel. We think it's because they pay to enter or wait at the airport, and don't feel the metered fare will justify the cost. We went to an unmetered minibus just beyond the main taxi rank, where the driver attempted to charge us 100,000 VND each but eventually settled for 50,000 each. We had a 6 am flight, so we have to find a hotel near airport, it seem this is the only hotel avaible at the moment, since it’s a 2 stars hotel and we only plan to sleep for few hours, we don’t have high expectation, the room size is considerable larger, and we had two larger queen size bads, however the beds are hard like the floor, bathroom has no shower, there’s a small water hose only. The owner is a very quit boy, he understand little English, but willing to got up 4 am to take us to the airport for few bucks, that’s nice of him. Worst hotel ever! We tried to go there walking but it was impossible to find and you have to walk on a motorway. Taxis don't want to take you because it's too close, when we finally arrived at the hotel, (the taxi stopped at a few hotel on the way to ask us if it was the hotel we were looking for), the owner asked us to pay 4dollars to the taxi driver, we didn't have any dollars, only dongs, and on the taxi meter it was written 50000 DONGS, which is way less than 4dollars. The taxi driver, irritated, took the money!! The room was ok, but the bed was very hard, the wifi was slow. The next morning a taxi was supposed to take us to the airport, but there were no taxi, the owner called a taxi, after a few minuts he told us there were no taxis ! So he took us to the bus stop with his motobike ! Yes, in the end there was a bus stop ! I guess you can't complain for the price but the bed was seriously the hardest thing I've ever slept on. I think the floor would be softer! Also its close to the airport but in middle of nowhere street off the highway. We arrived and there were no food options nearby. Still room was clean, staff super nice and wifi super fast. It's a clean budget airport hotel, nothing much more to say. It's a little difficult to find and the taxi driver claimed to not know where it was and wanted to drive around the general area for a bit but we refused and got out and walked - only to discover his taxi rank was just around the corner from the hotel. (It's on the main road that runs parallel to the airport road , not in the warren of roads in between where a lot of other hotels are). The owners son? speaks a little english and he offers an airport drop off for $4 (which includes the airport $1 fee) If you have an early flight it's a good option. quick to airport, had own taxi to take us,had a fridge in the room which we needed water and there are no shops nearby. Stay was fine.bed was hard but for one night it's suitable. Bathroom and room were clean, basic but again all you need for one night. The staff didn't speak much English but understood the need for taxi early morning. Our main problem with this hotel is getting there, as I had read, taxis at the airport don't want to take you as it's too close, when you do find someone you get royally ripped off! If we didn't literally have another flight 10 hours after our previous one it would be better financially to stay further away. Staff were nice, cheap transfer and room was clean. We had an early flight so we stayed here to rest the night before. There is only one restaurant in the street and it was not very nice, plus we were charged more than any where else in Vietnam, you would be better going to the airport and eating on the 4th floor accessible from the lift which you can go to before you go through to departure lounge- cheaper, cleaner and better food, and then getting a cab back. 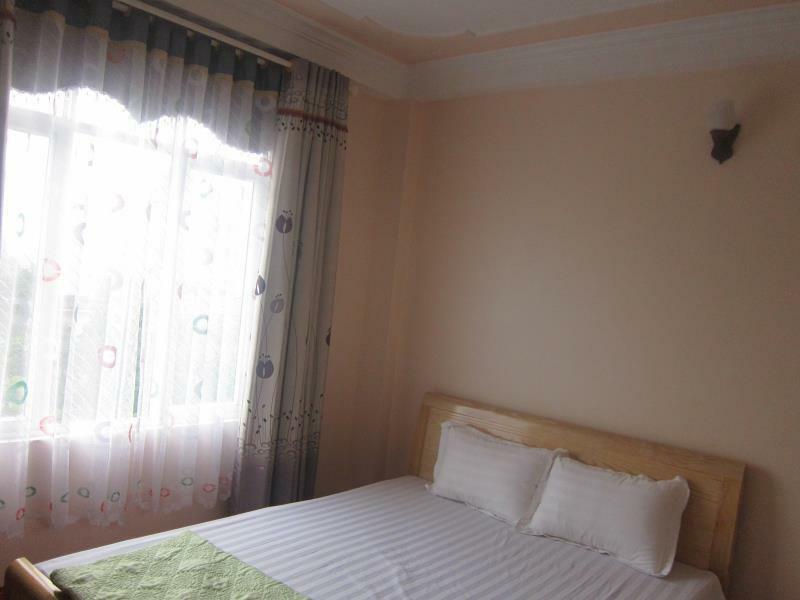 Although clean the beds were rock hard and only Vietnamese tv available. Not what we were after but staff were lovely. This hotel was a convenient option very close to the airport. It is nothing , just the basic necessities including hot water and English speaking staff. If you get there late you may have to knock as the gate will be closed, but someone will be there to open it. The wifi there is also good.